Photoshop CS has long been considered the world's best image editor, and it's now the standard by which all image-editing programs are judged. But it's not without flaws - it's both complicated and expensive. So we've taken a look at six cheaper alternatives to Photoshop. Our round-up of Photoshop alternatives doesn't just list programs that offer the same or similar tools as Photoshop, but for less, though. It also has programs that approach photography in a different way. So don't imagine that Photoshop CS is still the only serious choice photographers, because any one of the six applications on test could change your mind. Photoshop Elements takes some of the core tools from Photoshop and wraps them up in a novice-friendly interface so new users won't be daunted but more experienced photographers can still apply advanced image manipulation techniques. In fact, Elements is not one program but two. As well as the Elements Editor, there's an Organiser application with some powerful tools of its own. Adobe Bridge, which comes with Photoshop, is a fairly basic browsing tool for viewing the contents of your folders, but the Elements Organiser is a more sophisticated database application that allows faster searches and the ability to bring photos together into themed Albums, without changing their location on your computer. The Editor itself works in three modes: Simple, Guided and Expert. In Simple mode you can carry out basic adjustments in a semi-automatic fashion with the minimum of jargon. Guided mode introduces more ambitious effects by explaining specific tools and helping you apply them step by step. These Simple and Guided modes are great for novice and intermediate users, but they could easily give the impression that Elements is a seriously dumbed-down version of Photoshop. It's not - and the Expert mode shows just what it can do. From a photographic point of view, there's not much that Photoshop can do that Elements can't. You can create layers and selections in just the same way, and apply the same effects and adjustments. There are exceptions - Elements offers only basic curves adjustments, for example - but most techniques you would use in Photoshop can be applied in Elements too. The Photomerge Panorama, Scene Cleaner and Exposure options are clever and effective, and Elements 11 has Adobe's latest 'content-aware' technology that can be used to remove objects and filling gaps. Lightroom and Aperture can both be set up to use Photoshop as an external editor, but you could just as easily use Elements instead. And the combined cost would still be less than half what you'd pay for CS. Lightroom takes care of all your photographic needs, from importing your photos to organising them, enhancing them and sharing them with other people as books slideshows, prints or web galleries. It's arranged as a series of modules, displayed horizontally along the top of the window. It's in the first Library module that most of the work is done. Here, you import your photos then browse them in their original folders, or organise them into Collections for specific jobs or projects. You can also create Smart Collections, which use search criteria to automatically pick out shots taken within a certain time period or with keywords, for example. You enhance your photos in the Develop module, and the editing tools here are based around those in Adobe Camera Raw, the same raw-conversion software that comes with Photoshop. The tools are arranged in a more accessible and logical format though, using collapsible panels at the side of the screen. Lightroom makes no distinction between raw files, JPEGs, TIFF images or Photoshop files - it works on them all in the same way. Finally, all the adjustments you make are non-destructive - the original images remain unaltered, and you can modify or remove any of your adjustments at any time. Lightroom's editing tools don't match Photoshop's. It can't layer images, for example, and while it can carry out localised adjustments to colours, tones, clarity and more, it doesn't offer precise selections as such. Its tonal and colour enhancement tools are quick to apply, effective and easy to undo. It's very good at enhancing specific colours or colour ranges, carrying out black-and-white conversions and curves adjustments. It incorporates Adobe's automatic lens correction profile, and the Adjustment Brush and Graduated Filter tools are very quick and useful. If your main interest is making the most of your photographs, rather than combining images in montages and applying special effects, you won't mind that its editing tools are more limited. This makes Lightroom a genuine alternative to Photoshop, but you can't rule out the possibility that you might still need Photoshop (or Elements) for certain jobs. Aperture is Apple's equivalent to Lightroom. It works on exactly the same principle, importing your photos into a database for rapid, flexible organising and searching, and applying non-destructive editing processes that preserve the original images untouched. These are your Masters, and they can be stored either in their original folders on your hard disk, or copied into the Aperture library. What you see and work on are Versions of these Masters - though you can export new files with all the adjustments applied when you need them. 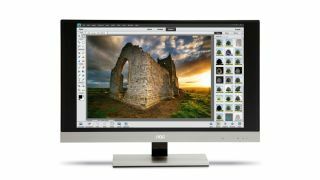 Aperture is especially fast and efficient at organising all your images, more so than Lightroom in fact, but its editing tools are not quite as good. The approach is the same as Lightroom's. The tools are all arranged as a series of expanding panels down the side of the screen, and they're stored in the Aperture Library rather than being applied directly to your images, or Masters. These adjustments can be reversed, modified or removed at any time. You can carry out basic adjustments such as cropping, Levels adjustments, Curves and sophisticated hue, saturation and tonal adjustments, but while Aperture can correct chromatic aberration, it doesn't fix lens distortions, either with automatic lens correction profiles or even manually. It does offer localised adjustments via Quick Brushes, for tone and colour enhancement, sharpening and noise reduction, for example, but they're not as straightforward to apply as Lightroom's Adjustment Brushes. This makes it all the more likely that you're going to need a separate image-editing application for anything other than routine image enhancements. You can save adjustments as preset effects, just as you can in Photoshop Lightroom, but where Lightroom could conceivably replace Photoshop, it's unlikely that Aperture ever would. Aperture does have other strengths, including its efficient photo management, its photo book design tools, web galleries and web journals, which combine photos and text in the form of a blog-style website. It also has a unique Light Table feature for combining and comparing pictures on a virtual table to arrive at a cohesive and complementary collection for a portfolio or publication. However, while it's a very strong Photoshop complement for Mac owners - especially at just £55 - it's not a Photoshop replacement.